The Canadian Hardcover Edition–Viking Press, 2012. 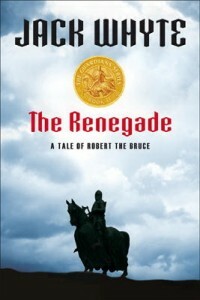 “Renegade”, the second book of the “Guardians” trilogy, deals with Robert the Bruce, right up to the moment when he changed History by deciding to change his allegiance and defy Edward of England by refusing to make war against his own people. Was he the Renegade, or was it Edward himself? The Canadian hardcover release of the book was in late summer of 2012, whereas the US, and UK editions appeared in 2013, as did the Italian translation, “Il Rinnigato”. All are now available in paperback and eBook formats. Robert Bruce awoke in a foul humour on the day that was to change his life. He had no inkling that it was to be a day of days, but he was aware from the moment he opened his eyes that he would be glad when it was over, for he had no illusions about the unpleasantness of what lay ahead for him that day and the hissing drumbeat of heavy rain on the roof of his tent in the pre-dawn darkness set the tone for what was to come. Thomas Beg’s rumbling voice came from the darkness beyond the foot of the narrow cot and was followed by a muffled clank of metal from the firebox he had brought with him. Bruce lay unmoving in the darkness and thought about rolling out of bed, then relaxed and forced himself to ignore the noise of the rain, listening instead to the underlying sounds of his manservant tinkering with the firebox apparatus and visualizing the huge man blowing on the embers contained in the box as he fed them gently with dried wisps of peat moss, coaxing them into flame. A tiny halo of light sprang up in the pitch blackness and grew steadily stronger and moments later the metal door of the firebox clanked softly as Thomas Beg set the device carefully on the ground by his knees, grunting in concentration as he worked. Bruce waited, visualizing the care with which the big man would be extending a candle towards the tiny flame inside the box, then seeing the result immediately as the wick caught fire and sprang into life. Thomas Beg rose quietly to his feet, one hand holding the candle while the other cupped the flame protectively, then moved cautiously to where a second candle reared upright on the small table beside Bruce’s bed. Moments later the light from both wicks flooded the small tent and Bruce pushed himself up to lean on one elbow. Thomas Beg was looming above him, looking down with a frown stamping his features. Bruce threw back his blanket and swung his legs over the edge of the bed, then stretched hugely, the motion cut short as he flinched and hissed, lifting his feet again hurriedly at the shock of the chill groundwater soaked instantly into his thickly stockinged heels. “I warned ye.” Thomas Beg shook his massive head from side to side and handed him his heavy boots wordlessly, then stood watching as his earl struggled into them, forcing his wet-heeled stockings into place and then lacing the boots up tightly before he lurched to his feet and peered around blearily, shivering as he tugged at the long, padded and quilted undercoat and drawers that he had worn to bed. “Wait ’til ye go ootside, then, and wear your cloak,” his companion muttered as the earl went to the tent flaps and hesitated, holding the flaps open for a moment before he turned back and shrugged into a foul-weather cloak that hung from a peg there. Woven from raw, springy and unfulled wool that retained its natural water-shedding oils, the nameless garment was the best foul weather protection ever made and had been in use before the Roman legions ever came to Britain. Thomas Beg watched as Bruce stepped outside, and listened to the soggy sounds of the earl’s booted feet in the grass beyond until they faded into the rain-soaked night, then he turned towards the wooden, T-shaped frame that held Bruce’s armour. A quick glance told him everything was as it should be, and so he grunted and set his candle down beside the one on the table, then set about folding and rolling Bruce’s bedding. It was a task he could do in his sleep and he did it mindlessly, rolling and tucking and strapping until he had made a tightly compact bundle, then folding the trestle legs of the light, sturdy campaign cot and setting it on its side for collection by the camp crew. He poured water from the jug into the washbowl and unrolled the towel that lay beside them, laying it ready on the bedside table, then picked up a candle and raised it high, peering around the small tent to make sure he had missed nothing. When he was sure all was as it should be he stepped to the armour Tee and took down a belted pair of mailed leggings. He was holding the leggings spread and ready when the earl stepped back inside, his head bent as he fumbled with the lacings at his crotch, adjusting the weight and distribution of his genitalia before straightening up to raise his arms and allow Thomas to feed the belt of the leggings around his waist. He buckled and cinched it tight and turned his back to allow his man to fasten the straps that held the leggings tightly in place from mid-thigh to ankles, then wriggled awkwardly until he felt the heavy garment settle comfortably. When he was satisfied with the feel of it, he bent over the bowl on the table and rinsed his face and eyes, then scooped water over his short-cropped hair, scrubbing it into his scalp and the back of his neck before reaching for the towel. He wiped his eyes first and then held both ends of the towel and scrubbed the nape of his neck from side to side vigorously with the rough cloth before dragging it down over his wet crown and drying his face and hands. The response was sardonic and Bruce managed his first smile of the day as he turned to face the other man who was now holding out his hauberk, the heavy, wrist-to-ankle-length overcoat of fine, tightly-woven chain mail that was worn over the thickly quilted under-tunic in which the earl had slept. “Let’s get ye into this and then we’ll eat,” the big man growled. They worked together in silence then, both of them frowning in concentration as Bruce shrugged awkwardly into the heavy, confining garment, thrusting head first into the neck opening then struggling to insert his arms before pulling and hauling until the bulky, iron-heavy body and mailed skirts fell into place. A man could dress himself in a mailed hauberk unaided, but it was a sullen, thankless task and most preferred to work at it in pairs, sharing the difficulty and cutting it by more than half for each of them. Thomas Beg, over years of working with Bruce, had developed a knack of settling the job quickly and Bruce was quietly grateful for his skill, though Thomas himself wore only a mailed, short-sleeved shirt that hung to mid-thigh beneath a leather jerkin. The big man preferred to have his huge arms free of encumbrance when he swung the heavy axe that was his primary weapon, and his only concession to armouring himself below the waist was a thick set of heavily-boiled and hammer-welded bullhide thigh coverings, hinged and strapped to cover front and rear and reinforced with narrow, riveted, overlapping strips of steel. The boots he wore were similar to Bruce’s own, made by the same boot-maker but reinforced, like his thigh greaves, with more of the steel strips that were strong enough to shed a swung blade. Bruce waited patiently again while Thomas deftly snugged and tightened the straps that held the hauberk fastened at his back—the most difficult of all to fasten alone—and then nodded, satisfied. The long, chain link coat, reeking with the familiar mixed odours of human and equine sweat, raw metal and the thin coating of oil that was used to keep the links from rusting, was split to the waist at front and rear, permitting its wearer to sit astride a horse and Thomas Beg stepped back, examining the hang of it critically before he nodded and then turned away to bend over the metal firebox that still sat in a corner of the tent. He picked up the cloth-wrapped bundle that had lain there on top of it, unseen by Bruce, and turned back, unfolding the cloth to reveal a steaming treasure that made Bruce grin with pleasure and surprise: a juice-rich slice of meat had been compressed between two inch-thick slabs of bread and then cut into twin portions. Thomas Beg sniffed and picked up one of the pieces, holding it out to him. Neither man spoke after that until the food was gone and then, still in silence, they completed the task of armouring the earl, seating the tight-fitting, leather-lined coif of mail comfortably on his head with its skirts covering his neck and shoulders and lacing it beneath the chin before adding the leather-hinged, heavy casing of steel that protected Bruce’s back and chest. Thomas Beg was hauling on the last of the buckled straps at Bruce’s waist when the roaring drum rattle overhead abruptly died away, leaving only the rapidly dwindling, sluicing sound of running water being shed from the sloping roof. Both men stood motionless for long moments, listening to the growing silence until Thomas grunted and sniffed. He stepped away and opened the tent flaps, where he stood peering out for a while and listening to the splashing sounds of unseen people moving around in the darkness. A loud clatter of falling pikes and a disgusted bark of profanity announced that someone had blundered into a pile of stacked weapons in the dark, and he turned his head to look back to where Bruce stood watching him.